I came across this recipe which I thought will complement my chicken curry . Fluffy Deep Fried US Potato Bread ! And was I glad that I tried it out? Yup….it was good and everyone loves it . Knowing me…I will not leave it alone till I had tried it out and what more since I have some leftovers of the chicken curry in the fridge! 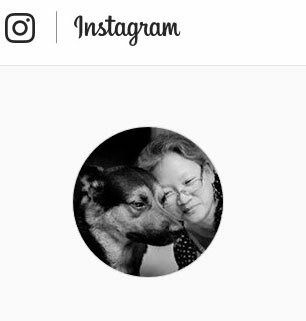 Hi Piggy gal, Momsie mizz you too...* muax, muax :p Time will zip fast...in a wink you will be back again for the long break. Think of all the good food you will be having then....yum yummy! 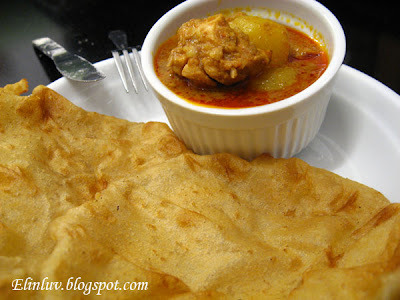 seeing those combination of ingredients, I can tell you I just love it, an awesome delicious potato flatbread, some more with chicken curry, I am toatlly drooling! I can tell from the picture how tasty they are. What time is dinner? I will be there. Those puffed up Potatoe Bread sure looks inviting..... especially, dunk it in curry chicken, yum, yum. That chicken curry looks amazing!!! Looks great! Kind of reminds me of Chinese pancake. This looks absolutely awesome. I am going to try this!!! @ Angie's Recipe : Angie, this potato bread is yummy...can be eaten alone too. Taste great! @ Natalie : :) it tasted better becoz it uses Atta Flour. Very fragrance! @ Miranda : Yup this potato bread is great. Thanks for the award :) I love your blog too. 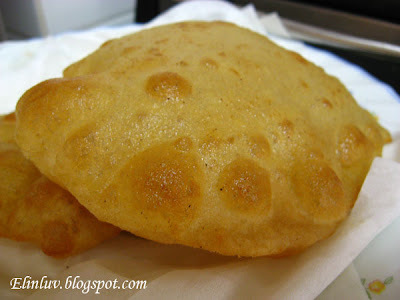 at first glance I thought your deep fried potato bread look like roti puri which I bought in frozen form from Indian grocery store..but your post title throw me off until I read your post!! lol! 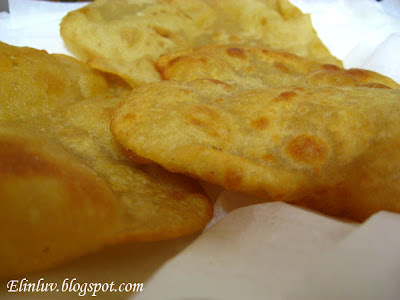 thanks for the sharing the recipe..must try one day to make myself..
Wholemeal flour.. Healthy indeed! What's atta flour and where to get them? Is atta flour the ones to make chapati? eh how true. 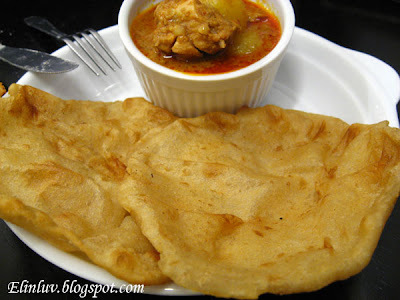 really like poori lah! @ Little Inbox: Yesss...served with leftovers of the chicken curry I cooked :) delish! Atta is obtained from grinding complete wheat grains. It is creamy brown in colour and relatively coarse compared to other types of flour. Since nothing is removed from atta, all the constituents of the wheat grain are preserved. Traditionally, atta is made by stone grinding, a process that imparts a characteristic aroma and taste to the bread. High bran content of atta makes it a fiber-rich food. The temperatures attained in a "chakki" (stone grinder), produced by friction, are of the order of 110-125 deg C. At such high temperatures, the carotenes present in the bran tend to exude the characteristic roasty smell, and contribute to the sweetness of the atta. Love the sound of this. Sounds perfect with the curry!